The same kind of irritants (dust, pepper, etc.) can create the same internal reaction in all of us, but its externalization is highly individualized. We all know that everyone sneezes differently, but have we ever considered why? For being such a common, everyday occurrence, that little (or big) expulsion of air is actually a complex process involving more nuances than many of us realize. 1. Sneezing’s official name is sternutation. 2. We can’t sneeze and keep our eyes open—and no one knows why. Scientists are still unclear as to why our eyes reflexively close during a sneezing episode. Some believe that it’s an evolutionary adaptation meant to protect our eyes from whatever particles come flying out of our noses and mouths when we sneeze. Others claim it’s just one of many muscle contractions that take place during the progression. And the old wives’ tale about eyelids closing to keep the eyes from popping out is impossible. While a hearty sneeze can put a good amount of pressure behind one’s eyes, it’s not enough to do that kind of damage. 3. How we sneeze could say something about us. Of all the characteristics that potentially reveal our inner selves, I never thought sneezing could be one of them. However, body language expert Patti Wood says otherwise. She did Benadryl-sponsored study of 547 people and their sneeze habits, coming up with four types of sneezes that she believes are personality indicators. The “Correct” carries Kleenex and is careful to cover her mouth when sneezing, meaning she’s respectful of others and likes to maintain a dignified disposition. The “Supporter” tends to hold in sneezes rather than risk sneezing on someone, which indicates a quiet and caring character. The “Expressive” makes a big production out of sneezing and often sneezes multiple times at once, possibly making her a showy and dominating person. The “Driver” sneezes loudly but quickly, making her direct and forward-thinking. 4. Pepper and pollen aren’t the only things that make us sneeze. Dust, pollen, and pepper are cited as the most common sneeze catalysts, but they’re by no means the only ones—or the strangest. 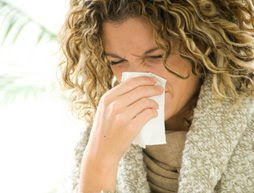 Particularly pungent aromas and temperature fluctuations, particularly colder air, can make us sneeze, too. Plucking our eyebrows also triggers sneezes in some because it can stimulate nerves in an area connected to the nose. Rubbing one’s eyes and popping pimples cause the same reaction for similar reasons. About one in three people sneeze when exposed to bright lights, an inherited trait called photic sneezing or ACHOO (Autosomal Dominant Compelling Helio-Ophthalmic Outburst) Syndrome, which also involves sneezing in rapid succession (usually two or three times). Snatiation is a term used to describe the multiple sneezes that come after eating a big feast; it’s also passed down via genes. 5. Sneezes travel fast and furiously. One person’s sneeze can travel up to one hundred miles per hour. The particles and spit emitted when we sneeze can travel up to five feet away, making it all the more important to cover our mouths and noses to protect innocent bystanders. Even if no one’s standing right next to us, the bacteria sent into the air by our expulsion can spread up to 150 feet away. You could be walking down the street through someone’s sneeze bacteria and not even know it, so just think about that the next time you fail to reach for a handkerchief. 6. Superstition’s nothing to sneeze at. Sneezes happen so quickly and suddenly that it’s difficult to fathom just how much work goes into one. It’s so commonplace that we rarely give much thought to the process, yet it’s ingrained enough in our lives that we devote folklore and entire social responses to it. There’s so many different sneeze characteristics we often fail to consider—the intricate physical mechanics behind it, what being a loud or silent sneezer says about our personalities, and even whether we expect someone to say “Bless you” or “Gesundheit” in response. Although if you sneeze like my dad, you already have that last one covered.